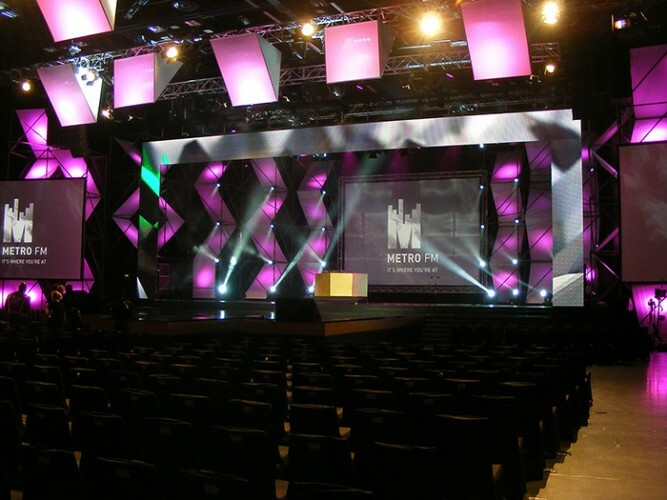 Lighting designer François van der Merwe of Wizardry Group chose Robe moving lights to be the central fixtures of his classy lighting scheme for the 2013 Metro FM Music Awards event, staged at the Durban International Conference Centre Arena in South Africa. 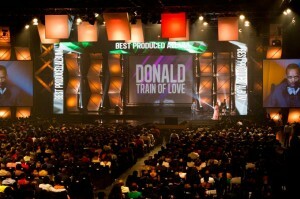 François was working for Dream Sets, commissioned to deliver the technical elements of the event for producers, Blue Moon Corporate Communications. 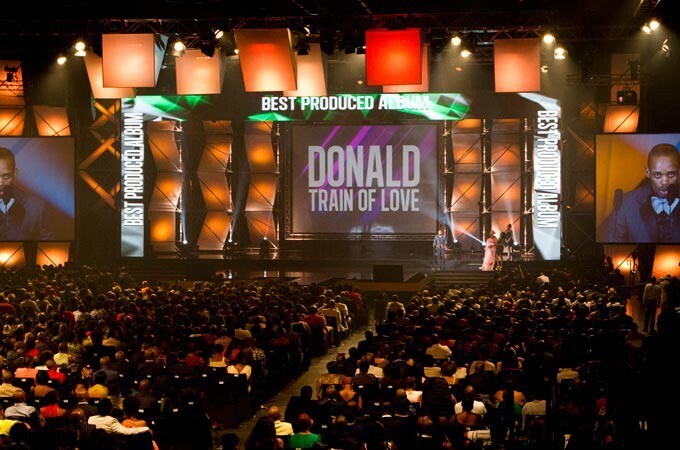 Dream Sets’ Robert Sean Hoey and Eben Peltz were technical directors and worked closely with leading SA rental company Gearhouse South Africa, whose Durban facility supplied most of the equipment used on the show. Seventy-six Robe fixtures were used in total: 24 Robe ROBIN LEDWash 600s, 24 LEDBeam 100s, 12 ColorSpot 2500E ATs and 16 ColorSpot 700E ATs together with generic and LED lights, all programmed and operated by François using a grandMA2 full size console. The design was a careful blend of theatrical and televisual elements for the show which was hosted by popular Metro FM DJs Azania Mosaka and Robert Marwa and for the first time broadcast live on national channel SABC1. The LEDWash 600s were primarily used for powerful back lighting and for in-fill from the sides. He chose them for their diversity. The back lighting units could be zoomed out to give a nice even spread across the stage area and set, and then zoomed right in for more 'beamy' effects. His other main reason for picking the LEDWash 600 was “their rich colours,” he explains, adding that he also likes the range of soft pastels, and the fact that the LED rings can be zoned and programmed individually for 'eye-candy' effects when required. The LEDBeam 100s were rigged on scaff ‘nodes’ around the set. They were used to illuminate the scaff pipes and accentuate the depth of the structure when needed, and at other times were beamed straight out into the audience for dramatic wide angle camera shots. He thinks their super-quick speed is fantastic! The event was another resounding success for all involved.